Preheat oven to 350. Grease and flour or spray (with baking spray with flour) 1 loaf pan. In a medium mixing bowl, combine sour cream, egg, oil, brown sugar and cranberry sauce until thoroughly incorporated. Add flour, baking powder, and spices. Mix thoroughly. Fold in the chopped candied ginger. Pour into prepared loaf pan. Bake 45 minutes or until a toothpick inserted into the center comes out clean. Cool in pan about 5 minutes then invert to a wire rack. We are cranberry sauce lovers. I am not a jam or jelly person but I've made a wee bit of cranberry sauce expressly for a single chicken sandwich before and I am not afraid to admit it. Even so, there is a time when we have an excess of leftover cranberry sauce that needs to be taken care of. I've made a truly divine cranberry ribbon cake and a lovely cranberry sauce-oatmeal muffins but I wanted something new. So I made this loaf of bread, which admittedly has slight purplish hue, that has the cranberry sauce mixed directly into the batter. I used the pomegranate version of cranberry sauce (which my husband adored) and it was delicious, although I think any cranberry sauce would work. The flavor of the cranberry sauce is evenly distributed and punctuated by the the ginger. 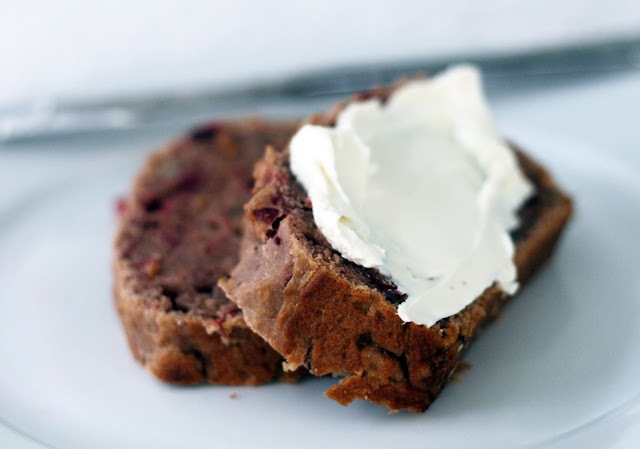 the result: a moist, flavorful bread perfect for breakfast (with a smear of cream cheese) or a snack. Heat the butter and oil in a large pot with a lid. Add the onions, carrots, celery, poblano pepper, potato, garlic and mushrooms. 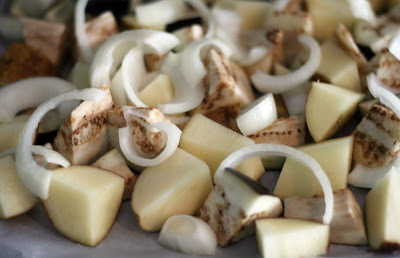 Sauté until the potatoes start to soften. Add the chipotle pepper, spices and stock. Cover and simmer for 20-30 minutes. Add the turkey and corn. Then whisk together the baking powder and flour in a medium sized bowl. Stir in the buttermilk, egg and green onion. Mix to combine. Scoop out 2-3 inch dumplings with a spoon or old fashioned ice cream scoop. They do not have to be particularity round and the dough will be very sticky. Carefully (to avoid splashing!) drop the dumplings one at a time into the pot. Cover and cook until the dumplings are fluffy and cooked through. I am always thinking of new ways to use up cooked turkey. While I love a turkey sandwich, there is only so many of them you can eat before collapsing of taste bud fatigue. I do occasionally freeze pre-measured amounts of cubed, cooked turkey breast for future use in soups, stews and chili but I don't mind using up some freshly cooked turkey in a new way. I've made some excellent chicken & dumplings in the past and thought I could revamp the recipe a bit to bring out the best in turkey. Turkey has a slightly stronger flavor than chicken so I decided to go for a full flavored, spicy dish. 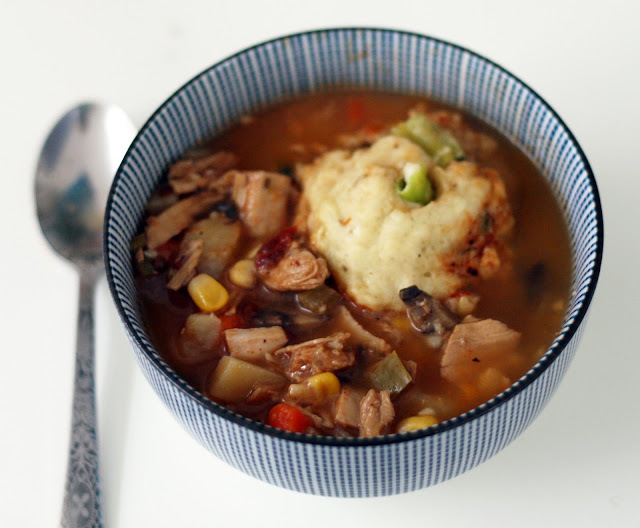 This version of turkey and dumplings will make memories of bland chicken and dumplings completely disappear. 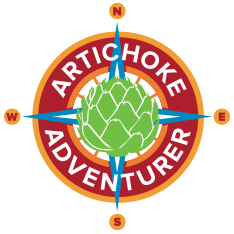 Tons of vegetables and chiles give this a rich flavor without adding fat and leave the dish tasting fresh rather than heavy or insipid. It is just a revelation. I honestly can't wait to make it again! In a saucepan, bring the broth to a simmer. Heat oil and butter in a large saucepan Saute the onion, celery and carrot until softened. Add the rice and sauté for 2-3 minutes, stirring continually. Add the broth a 1/2 cup at a time, stirring continuously, and waiting until the liquid is absorbed before each addition. When you are about half way through the broth, add the peas and turkey to the rice. Continue to add broth and stir. When the risotto is creamy and the rice is al dente remove from heat and stir in the cheeses. Can you get any homier than risotto? It is just so creamy (without actually using cream!) and warm-perfect for cold weather. 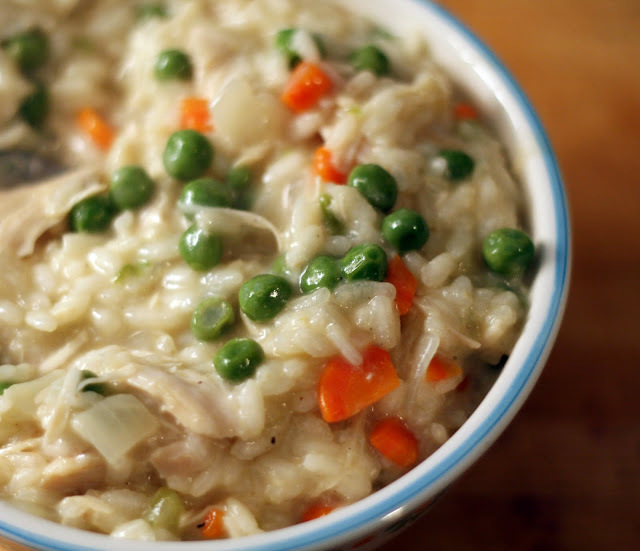 I love adding meat and vegetables to risotto to make it a filling one dish meal. This version has peas and turkey stirred in at at the end to give it a really fresh flavor. The small amount of smoked Gouda gives it a richness without being overpowering. This risotto reminded me of those old fashioned turkey and rice casseroles with the gravy but is much lighter and has brighter flavors. Perfect for post-Thanksgiving when you want to use up the leftover turkey (and probably have peas and carrots on hand) but don't feel like making a big, fussy meal. In a large pan, saute celery and onions in butter and olive oil over very low heat until the onions are translucent. Do not brown. Allow to cool slightly. Add to bread cubes in bowl and add spices, zest and parsley. Combine with egg, oysters and broth. Add oyster liquor to further moisten if necessary. Form medium-sized balls. Refrigerate until ready to use. I've always heard about oyster stuffing and its popularity, especially here in the mid-Atlantic but never actually had it until I made this. 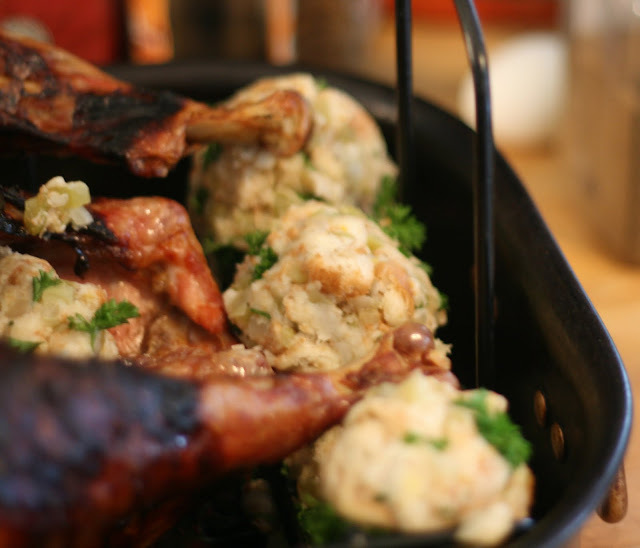 I grew up eating a more basic stuffing but as an adult I've branched out a bit while still making the stuffing into balls and arranging them around the turkey. 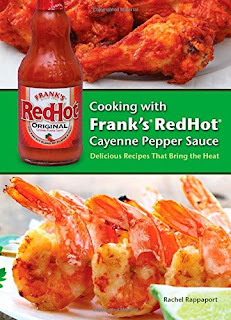 It really is the best way to get the flavor of the turkey without compromising the cooking time or safety of the turkey. Anyway, I am not sure what traditional ingredients are in oyster stuffing besides oysters so I added my favorites, celery seed and lemon zest along with some basic seasonings. I loved it. 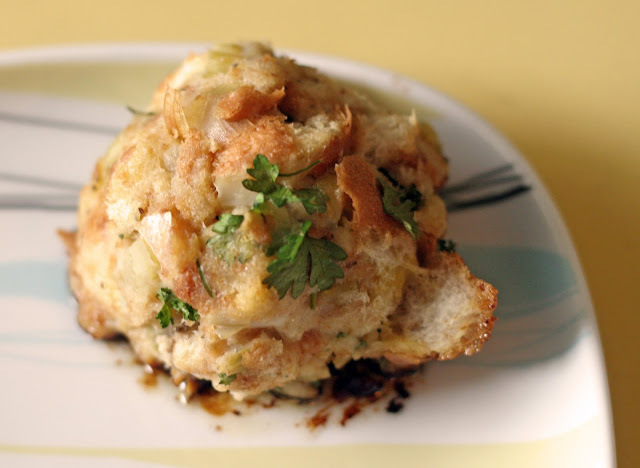 The oysters added a great flavor and made the stuffing seem extra special and worth the effort. Not to mention it was a great excuse to buy some local, Chesapeake Bay oysters which I always appreciate. Preheat oven to 325. Place the turkey on the rack and position in the roasting pan. Whisk together the molasses and olive oil. Brush over the bird. Sprinkle the turkey thoroughly with salt and pepper. Roast for about 3 hours or until the juices run clear and the leg is easily moved. Allow to sit for about 10 minutes before carving. This method of roasting turkey results in a moist, juicy turkey with crisp, burnished skin. The pomegranate molasses adds a bit of tartness but it also really seals in the juices. The salt draws the moisture out of the skin so it crisps up. The result: the perfect nontraditional turkey. Place the cranberries, pomegranate arils, water, juices, sugar, and zest in a medium saucepan and, stirring occasionally, cook for 20 minutes over medium high heat to reduce and thicken. Remove from heat. Serve hot or cold. As I am sure you can tell, we are cranberry sauce fans. I am always trying to think of a new variation. I was more than pleased at how this one turned out. I wasn't sure what would happen to the pomegranate seeds (the cranberry seeds, of course, pop) but they reacted to cooking in the best possible way; they stayed whole and provided explosive bits of flavor. The seeds inside softened enough that they weren't terribly crunchy or intrusive, which had been a bit of a concern. While I love eating pomegranate seeds out of hand, a hard bit isn't expected in cranberry sauce. 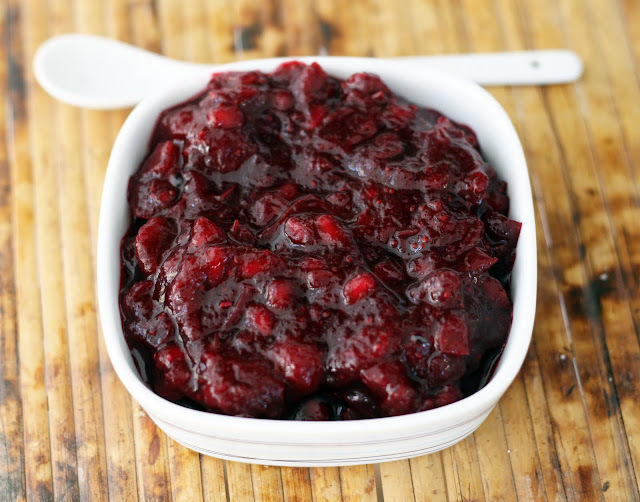 A welcome addition to our cranberry sauce rotation: fresh, sweet-tart and intensely fruity. Whisk together the vinaigrette in a small bowl. Set aside. Toss together the salad ingredients. Stir in vinaigrette. Serve at room temperature. Quick Tips: If you have one, a mandoline makes quick work of thinly slicing the vegetables. I bought this inexpensive mandoline last year and it works well. 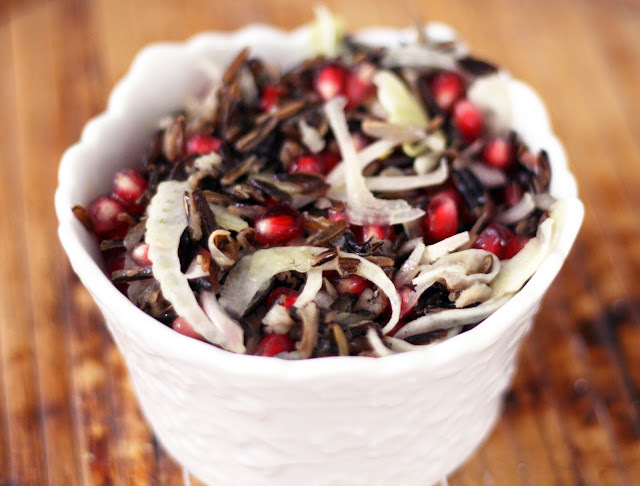 I like to make the wild rice for this salad the day before. Refrigerate it then fluff it with a fork before adding the remaining ingredients. This is a great late autumn or winter salad. Pomegranates are at their peak and fennel is widely available. A lot of recipes call for mixing wild rice (which actually isn't rice at all but a kind of marsh grass) with long grain rice but I prefer it by itself, especially in a salad. I love how the nutty flavor and chewy texture contrasts with the juicy pomegranate and crisp vegetables. I love the burst of flavor the arils provide. While I like it as a side salad, it is hearty enough to serve as main dish. Place the sauerkraut, shallot, horseradish, sugar, vinegar and spices in a 2 or 4 quart slow cooker. Stir to evenly distribute all ingredients. Add the pork chop and cover in sauerkraut. Cook on low 8 hours or 4 hours on high. 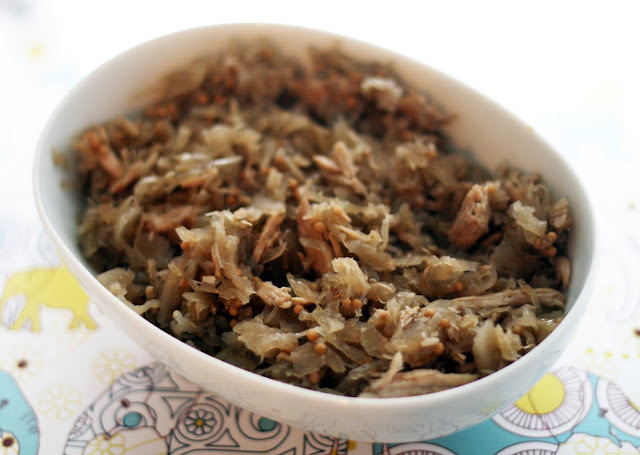 The pork should be easily shredded with a fork. Shred the meat and stir. Serve hot. One of the (many) little quirks of living in Baltimore is that we always eat sauerkraut with our Thanksgiving meal. I was in college before I realized that this practice was unique to Baltimore and that not everyone in country ate sauerkraut with their turkey. It dates back to the days when there was large number of German immigrants in the city. I think it stayed a staple because it is just so good with poultry. The salty, pickled flavor cuts through the sweet and richness of cranberry sauce and mashed potatoes. My family has only served plain sauerkraut (either homemade or commercially prepared) but this year I thought I'd splash out and make something a little different. So I created this recipe. Perhaps surprisingly, the red wine vinegar makes the sauerkraut slightly sweet and less puckeringly sour. I like mustard seed with my sauerkraut rather than the traditional caraway seed, I think the flavor melds better and the mustard seeds have a softer texture. The pork chop makes it taste more robust but leaving it out would make this a delicious (vegan) side dish. Starting on Nov. 16th, I will be posting (coordinating) Thanksgiving day recipes starting with side dishes and cranberry sauce. The following week will include turkey and stuffing. Look for Thanksgiving leftover recipes starting Thanksgiving day. Can't wait? Take a moment and check out some of my favorite Thanksgiving recipes from the past five years. I've never ended up with a dried out turkey. 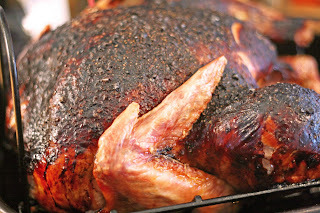 Check out tangerine scented roasted turkey, apple cider basted turkey, quick roasted turkey, brined turkey for turkey perfection. I have a unique way of making stuffing and I've created a few variations over the years. Try pecan stuffing, rosemary-sage stuffing, onion & celery stuffing or crimini unstuffing. We love apple cider cranberry sauce, ginger-lime cranberry sauce, tangerine-cranberry sauce, classic cranberry sauce and even homemade jellied cranberry sauce. 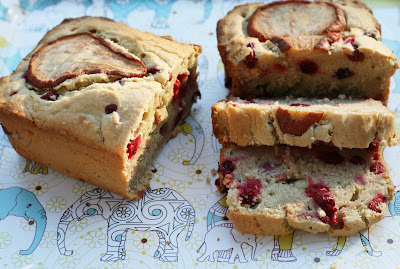 Use up your leftover cranberry sauce by making this yummy cranberry ribbon cake, cranberry cheesecake squares or muffins. Use up leftover turkey in tortilla soup, Thai noodle salad with turkey and shrimp, turkey enchiladas, turkey kasha varniska, and turkey gumbo. Preheat oven to 350. Grease and flour or spray (with baking spray with flour) 1 loaf pan. In a medium mixing bowl, combine sugar and butter until fluffy. Add the buttermilk, egg and pear, mix until thoroughly incorporated. Add flour, baking powder, and spices. Mix thoroughly. Fold in cranberries. Pour into prepared loaf pan. Top with 2 thin slices of pear if desired. Note: Peel and core pears before pureeing. It takes roughly 2 pears to make 3/4 cup puree. Don't worry about it being perfectly smooth, some small lumps are just fine. After making the truly divine blueberry goat cheese muffins this summer, I kept thinking about other baked goods that would be improved by using homemade fruit purees. 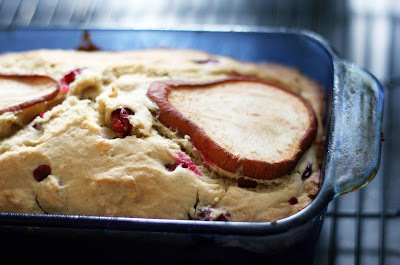 I just love how using puree spreads the flavor throughout the baked good rather than just having suspended bites of fruit which, while tasty, leaves some bites fruit-free. I had a ton of pears leftover from a recipe development gig so I wanted to use them up in a new way. 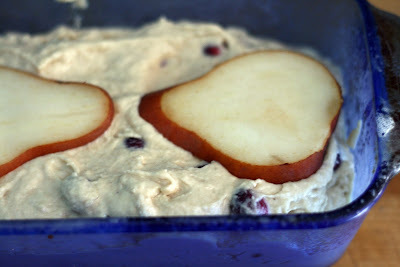 I love both cranberries and pears so I thought a quick bread marrying the two would be a great idea. While I have made muffins using chunks of pears that were quite good, I thought an even better way to get a true pear flavor would be to puree the fruit and fold it into the batter. I was right. Rather than fading into the background, the pear is every bit as present as the tart cranberries. The pureed pears also make the bread incredibly moist. In a large pot over medium heat, whisk together 1/4 cup sugar, milk and cream until the sugar dissolves and the mixture almost boils, about 2-3 minutes. Meanwhile, in a separate bowl, whisk together 1/4 cup sugar, salt and the egg yolks until it forms a ribbon and is yellow and creamy, about 2 minutes. Add about a 1/2 cup of the cream mixture into the eggs and whisk to combine. Pour the egg/cream mixture into the cream mixture on the stove. Add the cinnamon sticks and cook, stirring occasionally, for about 8 minutes or until the mixture coats the back of a spoon. Allow to cool on the counter then cover and place in the refrigerator to cool completely or overnight. Then remove the cinnamon sticks, stir in the pumpkin. Pour through a fine mesh sieve into an ice cream maker (I use this one) and churn until cold and set. Place in a freezer-safe container and freeze until solid. I love making ice cream because I can make it exactly as I'd like it. Not too sweet and unless it is chocolate, more subtle tasting than most commercial ice creams. This ice cream fits the bill perfectly. 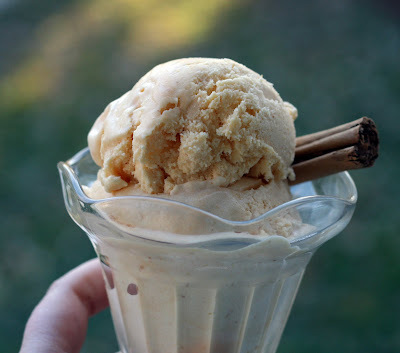 While the ice cream itself is rich and custard-y, the pumpkin flavor is light and fruity. 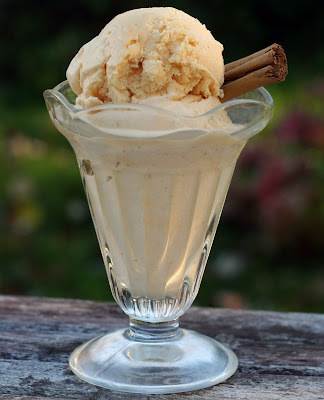 Using cinnamon sticks infuses the ice cream with just the right amount of spice and none of the gritty texture ground spices can give ice cream. I loved it. 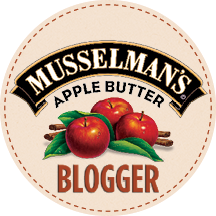 A great alternative to serving vanilla ice cream with pie or making pumpkin pie. It is worth it take a second to whisk it through a sieve before adding it to the ice cream maker just in case any bits of the cinnamon stick or chunks of pumpkin are present. Preheat oven to 375. 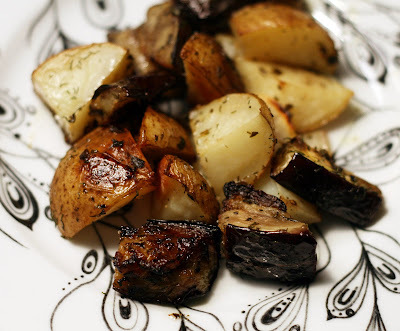 Place the potatoes and eggplant in a single layer on a lined baking sheet. Top with a layer of the sliced onions. In a small bowl, whisk together the oregano, oil, 2 tablespoons of lemon juice, dill weed and vinegar. Drizzle the dressing over the vegetables. Roast for 40 minutes or until the potatoes are fork tender. Stir and sprinkle with the remaining lemon juice. Serve hot. I often struggle with side dishes. Since we are a household of two, I tend to make meals that incorporate a lot of vegetables into the main dish so I don't need a side dish or if making a roast of some sort, a vegetable-potato mash. However, occasionally the need for a side dish arises. I wasn't sure how the cubed eggplant would hold up roasting for so long (baked or slow cooked whole for the same amount of time, the insides turn to mush that is perfect for dips but unappetizing on its own) but it worked just fine. It got creamy and soft but held its shape even when the potatoes were stubbornly slow in cooking. The lemon juice sprinkled at the end gives the dish a bit of brightness that is sometimes missing from long-cooked vegetables. I served it with lamb and a bit of good quality feta but I think it would go well with just about any roast or even served in a pita. Whisk together the flour, sugar, baking powder, and salt in a medium sized bowl. 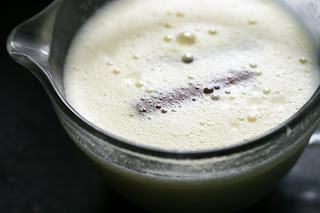 In a small bowl, whisk together the egg, oil, vanilla and milk. Add the wet ingredients to the dry and stir to combine. Fold in the chocolate and bacon. Follow the instructions included with your waffle iron to complete the waffles. For most large, Belgian-style waffle irons you would use 1 cup of batter for each waffle. I love my waffle maker. Much like the characters of Glee, I do think that chocolate and bacon go together even though, perhaps, they shouldn't. When I saw that Vosges had launched a bacon & chocolate pancake mix, I knew, without even trying it that this was something I could make at home. While it is nothing like the waffles we had in Belgium this fall (although, now that I think of it, topping sugar waffles with chocolate was pretty common)it was actually really good. I was careful to only use the meaty bits of bacon not much fat, so it added a crispy, smoky note to the waffles not a greasy one. 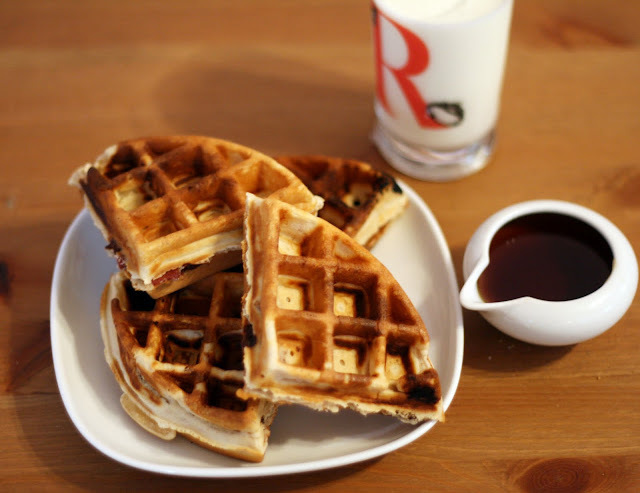 Anyway, chocolate + bacon + buttermilk waffles = over the top, decadent breakfast fun. Perhaps not fun that you'd want to eat every day, but definitely a delicious treat. Mix the spice rub ingredients together. Rub them on the pork. Sear the pork on each side in a hot, dry, nonstick skillet. Add it and all remaining ingredients to a 4 quart slow cooker. Cook for 8 hours on low. When done, meat should shred easily with a fork. Remove roast from slow cooker. Shred with a fork and set aside. Mash any solid bits of the sauce with a potato masher. Return the pork to slow cooker and toss to evenly coat in sauce. Serve on rolls. Note: If a slow cooker is not available, place the pork in a dutch oven and bake, covered for 4 1/2 hours at 375. This is a really decadent tasting pulled pork. The pomegranate arils (the seeds) just melt into the meat making it amazingly flavorful and tender. For even more pomegranate flavor, I used pomegranate molasses. You can buy it bottled at some grocery stores but Middle Eastern or Greek markets always carry it. It is actually made by boiling pomegranate juice down to a thick, syrupy liquid so it is possible to make it at home if need be. Anyway, I love pomegranate very much and realized that I had virtually no pomegranate recipes on the blog. That just needed correcting. 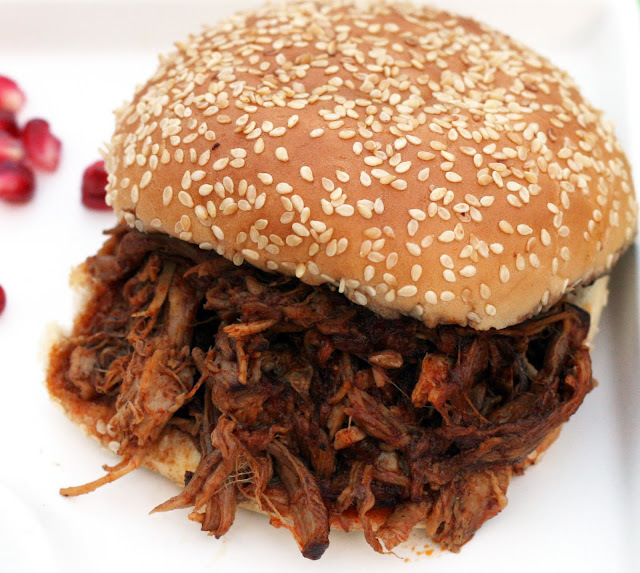 I've made a lot of pulled pork but this one is just amazing: juicy and smoky and fruity and spicy. Admittedly, the ingredient list is long but it requires virtually no work or effort on your part and the results are so fabulous that it is foolish not to make it. Bring a large pot of water to a boil. Add the garlic, potatoes, and cauliflower. Cook until the potatoes are fork tender. Drain. Add the goat cheese, butter, salt and pepper. Mash until almost at the desired texture then mash in the chives. When I first suggested boiling whole garlic cloves in with mashed potatoes, my husband was skeptical. But it only took one attempt to make him a believer. The garlic becomes soft and easily mashable but still very flavorful. 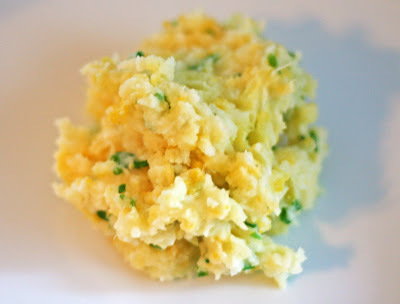 A much better option that having small minced bits of raw garlic in your mash, using powdered garlic or having to go through the trouble of roasting garlic. And while I am not trying to hide the cauliflower, it is virtually indistinguishable from the potato texture-wise. I love adding vegetables to mashed potatoes because it eliminates the need for a second side dish.